The fifth annual AAPE 1-Frame Team Competition was held February 19-21 at AmeriStamp Expo 2010 held in Riverside, California. Five teams participated. Koppersmith: "Mobile Alabama CSA Provisional Issue"
Kugel: "Australian Forces in the Boxer Uprising"
Gardner: "British Foreign Post Office in Morocco"
Miller: "Crown and Eagle Series: The 2 Pfennig Value, 1900-1912, & Its Usage"
Scoring for the 2010 edition was the same as last year�s contest with one change. 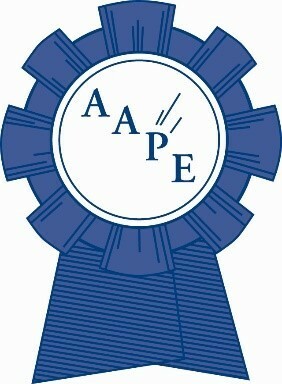 With the exception of awards presented by the APS and AAPE, a team would only receive bonus points for one award presented by any given society or sponsor. Teams earned a bonus of 5 points for each new entry. An exhibit was deemed new if it had not previously been shown at the national or international level. Likewise, teams earned a 5-point bonus for each Type of exhibit as selected from: Traditional (TR), Postal History (PH), Postal Stationery (PS), Revenue (RE), Illustrated Mail (IM), Display (DI), Thematic (TH), Aerophilately (AE), Astrophilately (AS), Cinderella CI), Special Study (SS) and Picture Postcard (PP). The following values were assigned to medal levels: Gold = 100, Vermeil = 90, Silver = 80, Silver-Bronze =70, Bronze = 60 and Certificate = 50. Additionally, teams earned bonus points for special awards. Winning the 1-Frame Grand Award earned 10 points, while all other awards, including the Reserve Grand Awards, earned 5 points. The table below lists the teams and the points each won. When the rules requiring three new exhibits and five different Types were replaced with bonuses, it was feared that the number of new exhibits would decline and diversity would suffer. Indeed, there were fewer new exhibits this year compared to prior editions. In 2010, 14 of the 25 entries (56%) were deemed new versus 22 of 35 (63%) for last year and 30 of 40 (75%) for 2008. On the plus side, the number of new exhibits still came close to the goal that three of every five exhibits be new. All entries for The Unconscious Incompetents were new exhibits! Diversity also declined somewhat. However, The Unconscious Incompetents are to be applauded for their diversity, with each of its 5 exhibits representing a different type. The table below lists the counts for each exhibit type and the percentage of each type for each of the last three years. At the meeting of the AAPE Board of Directors, a rules change was made that will be implemented for the 2011 contest increasing the bonus for new exhibits from 5 points to 10 points. It is hoped that this change will stimulate teams to enter more new exhibits, a primary goal for this contest when it was established. The Board also suggested adding a 10 point bonus for Youth exhibits (as defined in the AmeriStamp Expo prospectus) and a 10 point bonus for Novice exhibits (as defined by rules for AAPE Novice Award). These new bonuses will also be implemented for the 2011 contest. The 2011 rules will also include a clarification on eligibility. Eligible exhibits for the 1-Frame team competition must be eligible for the AmeriStamp Expo open 1-Frame category. Exhibits which are eligible for the 1-Frame Champion of Champions competition (winning a 1-Frame Grand at any WSP show, the 1-Frame Grand and Reserve Grand winners from AmeriStamp Expo, or 1-Frame Grand winners at Canadian national shows in the prior calendar year) are NOT eligible for the open competition. However, we learned that an exhibit which wins a 1-Frame Grand between the end of the prior year and AmeriStamp Expo is also NOT eligible to compete in the open 1-Frame category. Additionally, the exhibit type of Special Studies (SS) will no longer be included as it is no longer recognized by APS CANEJ in the most recent edition of the Manual of Philatelic Judging (2009 ed.). The next edition of the 1-Frame Team Competition will be held in conjunction with AmeriStamp Expo 2011, to be held February 11-13 in Charleston, South Carolina. Start planning now to enter a team!